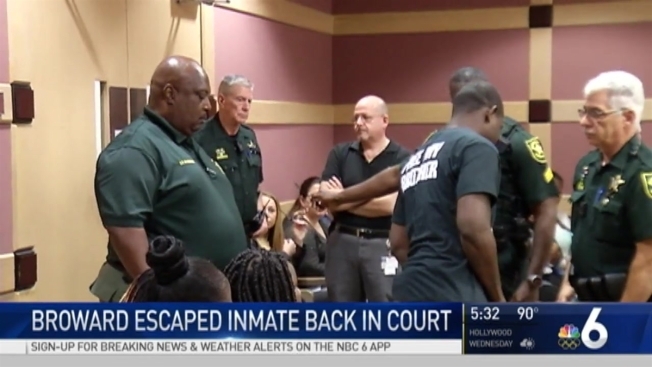 Eleven days after his escape from the very same courthouse that led to a five-day manhunt across South Florida, a Broward County murder suspect was back in court Tuesday. 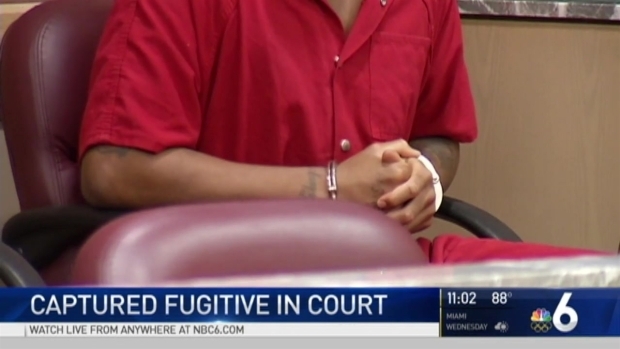 21-year-old Dayonte Resiles appeared in front of a judge, only this time with much more security than the July 15th appearance where he escaped from shackles and handcuffs and left through a back door at the Fort Lauderdale building. At least six armed deputies were inside the courtroom, while others were located outside of the chambers. Bailiffs required all people inside to turn off their cell phones, a move stemming from reports that one of the seven people who are alleged to have helped Resiles escape coughed into their phone as a signal that he had left the room. Over a dozen family members showed up in support of Resiles, many saying they believe he is innocent of all charges. Dayonte Resiles, a inmate on trial from muder who escaped for five days, was back in court with much more security. NBC 6's Ari Odzer has the story. "I think he's innocent and I believe he deserves a fair trial," aunt Latavis Johnson said. "They just want a closed case so they can pin it on him, I believe he was framed." He is charged with the September 2014 murder of a Davie woman inside her home. Tuesday’s hearing was to see if he would undergo a psychological evaluation, with both the prosecution and defense agreeing it wasn’t necessary. Resiles’ next hearing in court will take place in October. A hearing to decide whether the death penalty will be allowed in the case, which was the hearing Resiles escaped during earlier this month, has not been rescheduled. "It's certainly going to be difficult to pick a jury, given the amount of publicity that he received over five days," attorney Dohn Williams said. The escape prompted BSO to create new protocols to guard inmates charged with murder. When they're moved from the jail to the courthouse, armed deputies are with them all the time.